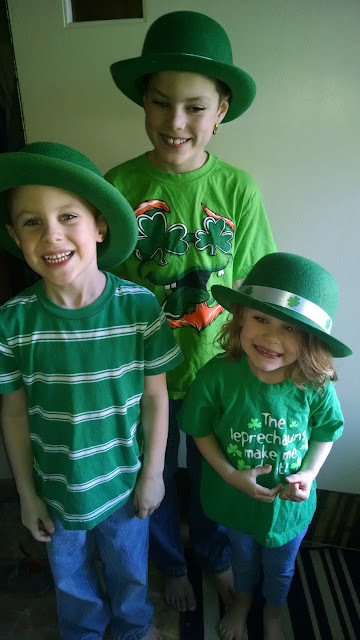 Just like a lot of people, we celebrated St. Patrick's Day on Thursday, but we did it kid style! There were decorations, crafts, games, sensory activities, an experiment, treats, and the biggest thrill of all: a surprise visit from a leprechaun! Talk about an amazing day! It's amazing what a few streamers, balloons, and hats can do to set the party mood. 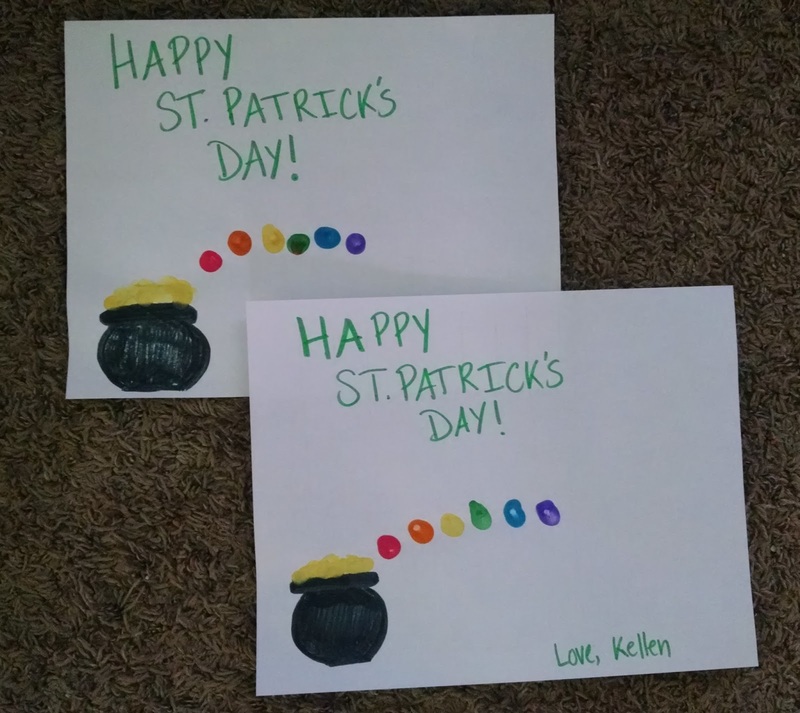 First craft of the morning was coloring Shamrocks. Since kids come at different times throughout the morning, this is a great way to start the day, let the kids know the theme for the day, and give the day a calming start. The Kool Aid scented rice bin got played with a lot throughout the day. The kids actually took everything St. Patrick's Day related out of the bin and got out mixing bowls and spoons. It made a fairly big mess on the floor (and got scattered throughout the house) but thankfully the rice vacuums up easily. The unexpected hit of the day was a visit from a leprechaun! The leprechaun from the sensory bin came to life and hid a pot of gold, all while the kids were playing! 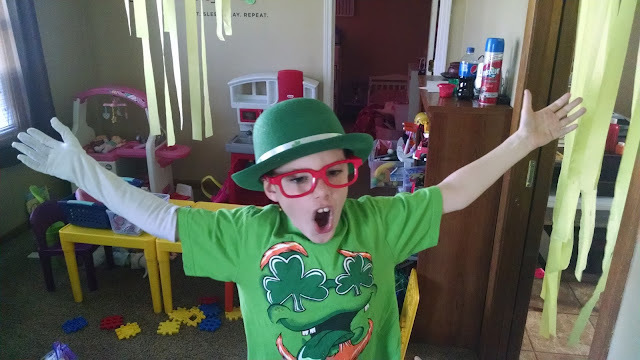 The rest of the day was filled with notes from our Sammy the Leprechaun with the kids squealing with delight every time they "saw Sammy move!" The day filled with magic because of one silly thing I decided to do. Sammy also provided a geography and history lesson on Ireland because at the end of the day, Sammy's magic had to leave to go back to Ireland. BUT he promised to see the kids again next year! 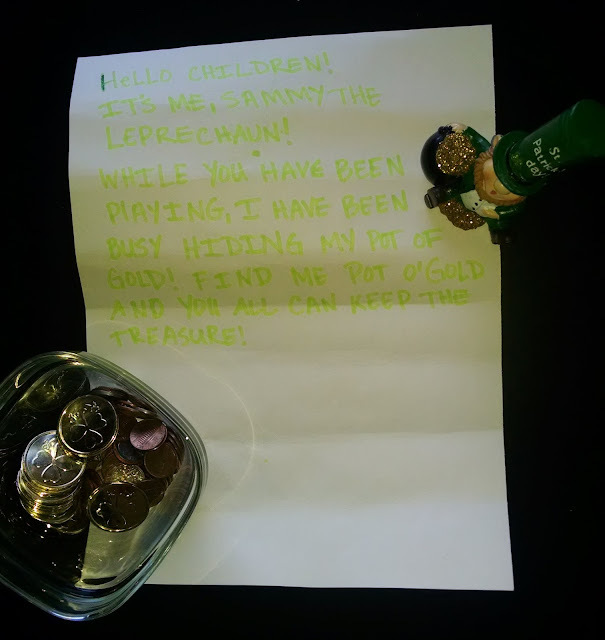 Sammy the Leprechaun hid from the kids not once, not twice, but seven times! The kids love our Find It game. 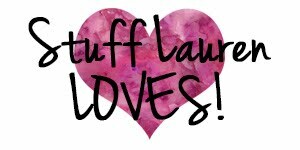 We play it A LOT with anything we can. The kids ate two rainbow fruit trays for morning snack. The art work for parents. The gold in the pot and the rainbow were made with their finger prints. Green cupcakes for an afternoon treat. Our baking soda and vinegar experiment/game is always a favorite. I started by putting gold coins at the bottom of the cookie sheet, covered it with a baking soda mixture (baking soda, water, and green food coloring), and then put it in the freezer for about 20 minutes. I put droppers on the table for the kids to easily drop the vinegar onto the baking soda. Eventually they just used their hands to dig through for the coins. They hid them again and again, turning this experiment into a smelly (thanks vinegar) sensory activity. 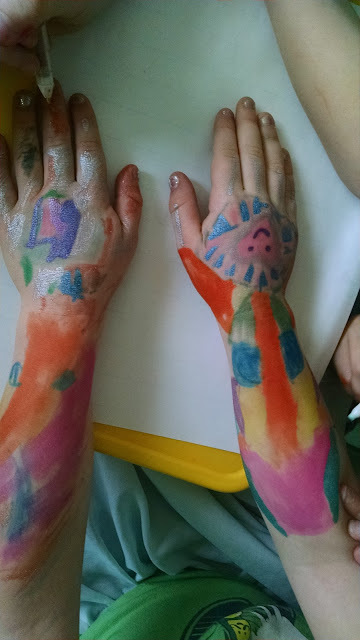 The kids ended the day coloring on their arms (and faces, hands, feet, legs) because "that's what a tricky leprechaun would do." My day may not have been spent at a parade or drinking green beer, but it was pretty darn great seeing the thrill the kids got from the simplest things about the day.